Distributor: Currently licensed by Aniplex of America, also available streaming on Crunchyroll. 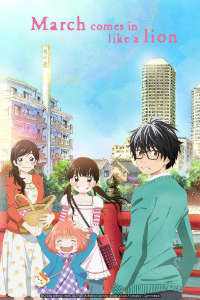 Rei Kiriyama is a 17-year-old whose parents and younger sister were killed many years before in an accident; he's now struggling to live independently as a professional shogi player (Japanese chess) while still trying to finish high school. The Kawamoto sisters - Akari, Hinata (Hina), and Momo- at least offer him some company (and free meals). Not the shogi stuff, of course. I came into the show knowing nothing about the game, and left the show knowing a bit more- that it's not played with distinctly shaped pieces like ordinary chess, but rather with flat markers with the pieces' identities printed on them; that it's played on a 9x9 board instead of the 8x8 of a chessboard, so there are some extra pieces unique to THIS game; those were the major things I could garner. It also seems that to play competitively one must first acquire an "angel" to support one's initial efforts, until one can start to win prizes in competitions. We're told later on that Rei is actually giving much of his prize money to his adoptive father, a man named Kouda. You see, after Rei's parents died, he was adopted by Kouda, who was Rei's dad's friend, and LIKE Rei's dad a passionate shogi player. In fact Kouda and his own children, a boy named Ayumu and a girl named Kyouko, were all aspiring to go "pro" at shogi. But Rei....well, Rei turned out to be a shogi prodigy, and that can be a problem in a family of competitors, especially if the prodigy isn't even blood kin. Ayumu appears in flashbacks, but seems to have otherwise disappeared from the story; but Kyouko is still around. Oh YES, SHE IS!!!! But I'm going to save her for a little later, and talk about some things that kind of ruined the show for me. One is the show's peculiar idea of humor, which it will reprise again and again, and is to have some character launch into an uncontrolled rant. (The triggers vary- for a character named "Smith", it's his cat- and some characters, like one called the "Chairman", don't require a trigger-they're like this all the time.) This is accompanied by Rei's reaction, which is depicted as panicked/terrified/embarrassed, and the depiction isn't done realistically because we know this is mostly representing what's in his HEAD, not on his FACE; Rei rarely shows overt emotion, typically coming across as an extremely quiet, mild-mannered individual (I believe "milquetoast" is the right word), with his lips usually set in a slight frown. Besides the Chairman, another character that needs no provocation to bellicosity is Rei's self-appointed "friendly rival", a chubby peer named Harunobo Nikaidou who he's been playing shogi with since childhood. Nikaidou's overbearing manner grated on me after a while, and truth to tell, playing shogi may not even be his greatest strength: despite his aspirations, he doesn't even seem quite in Rei's league, but he turns out to have a surprising alternate talent that he might really achieve more success in, were he to pursue it seriously. Still, again, Nikiaidou's over-the-top behavior, as with similar eruptions from the other characters, I just didn't find hilarious. I didn't really care that much for the art, either. This is one of those shows that, on the one hand, hews close to the manga-style character depictions (for example, the eyes often seem to have no pupils), while on the other hand throwing in "arty" touches like random reality (digitized photos of actual scenes), as well as SFX (i.e., a tornado in the middle of a snowstorm.) As with Your Lie In April, we have water- and especially depictions of our lead being UNDER water- as a recurring visual metaphor. Nor did I care much for the music, with one exception- the second opening song (the one that opens with the sisters on the bridge between their neighborhood and Rei's) has a snappy rhythm that I thought was OK.
AND- and I say this knowing it's almost heresy- I didn't really care that much for the Kawamoto sisters, who became kind of a surrogate family to Rei after he left his stepfather's house (for reasons I'll get to soon.) The oldest, Akari, is the one who first brought him in; the middle sister, Hina, explains that Akari likes to take in "strays" and make them "fluffy", which puts poor Rei in exactly the same category as the numerous cats the sisters have around the house. The sisters aren't very badly off- they look like they might be living with their grandfather ( or at least are being supported by him- he's around a lot, anyway), and work in his sweet shop; Akari also has a job at a hostess club, which is where she originally found Rei, on the club's doorstep, drunk and abandoned by the guys who brought him there. Much of the camaraderie between Rei and the girls is a product of common circumstance- the girls' parents passed away too (don't expect to get a lot of detail about this)- but it was somewhat off-putting to me to realize that Rei is, at least on some level, mainly a "project" for Akari, and since she's older than him (but not really by that much), there's nothing like a romantic attraction there. In fact, Akari can seem awfully detached- when she and her sisters first encounter Kyouko, the latter is publicly berating poor Rei, and while the younger sisters get pretty upset about this, Akari's attitude seems to be, oh, well, that's HIS business. (Yes, I WILL get to Kyouko, and I promise I'll have plenty to say about her too.) Hina, on the other hand, is too young (she's middle-school age), and while she's passionate by nature, it's in that teenage way of being passionate about things in general, and boys in particular- she really likes a fellow student who's also a ballplayer, and Rei lends her some assistance with that relationship. The youngest sister, Momo, is merely cute, following the standard criterion for Youngest Of Three Sister sets. (See Listen To Me Girls, I'm Your Father et al.) The artwork here is trying to make the sisters all look ethereal, I guess- angelic?- and so they are drawn with soft, rounded lines, which to me just made them look cartoonish, especially compared with the way their grandfather, or even Rei for that matter, are drawn- the Wiki article on the show has one of the manga covers, and the contrast between the way the sisters are drawn, versus the way Rei is drawn, seems much less there, so maybe the anime actually exaggerates this; if so, it's done the show no service as far as I'm concerned. Much more distracting, though, is the overkill in making the girls "rosy-cheeked"; the huge red blotches on their cheeks make them look like they're using a whole cosmetic counter's worth of rouge, or perhaps found some clown makeup. So let's say I found their visual depiction a bit cloying. But the show actually has some powerful drama in it, when two characters take their turns onstage. The most important one, by far, is Kyouko. Kyouko blames Rei for alienating her from her father (because she didn't have Rei's talent at shogi), and her barbed sarcasm directed at Rei nearly destroyed his self-esteem, and was a large factor in his decision to move out and live on his own, though he rationalized it to her (and maybe to himself as well) as being for HER sake. But she STILL couldn't seem to abandon her connection to shogi, and she took up with a guy named Gotou Masamune, who, we learn in the first flashback featuring him, actually once beat up Rei; when he first appeared I thought he was some young thug, but he's actually 20 years older than Kyouko, is a professional shogi player despite his yakuza manners (playing at a higher level than Rei, in fact), and is MARRIED- and he's now trying to spurn Kyouko, having grown tired of his affair with her perhaps. Kyouko eventually shows up at Rei's apartment, which he's understandably not thrilled about (I used to know someone LIKE Kyouko, so I understand the feeling), but for all her rage, her cruel sarcasm, and her self-destructive behavior, Kyouko has some deeply hidden vulnerability, and she knows that Rei is really a nice guy, and there are moments when even the worst sociopaths might seek the company, and support, of a decent human being. The best moment in the show just lasts a couple of seconds, and it's hard to even SEE, but it seemed like the most honest moment of emotional connection that Rei has with ANY character in the show, and yes, that certainly includes the sisters. As Rei himself notes (his stream-of-consciousness narration is also one of the better aspects of this show), he and Kyouko are sort of in an emotional limbo, neither able to abandon the other, yet neither one wanting to be a "real" sibling to the other. Rei says from time to time that he doesn't even really LIKE shogi, that it's just opened doors and paid bills for him, but the last episode of the series shows that Rei's not being entirely honest here, as we see Rei as a child on a class trip. Here was another resonance for me, for while I DID have parents, I otherwise could have been Rei on that trip. I guess if you don't have Shogi, you need to find some other way out of such holes. March Comes In Like A Lion © 2017 Shaft.